The advertisement about the Telangana Ayush Recruitment 2018 @ ayushrect2018.telangana.gov.in has published on 28th August 2018 by the Department Of Ayush, Ministry Of Health Medical & Family Welfare, Telangana Board for the Posts of 117 Medical Officer (Ayurveda & Homoeo), Lecturer (Ayurveda & Unani) Jobs. The Online Telangana Ayush Application Form started and ends up to the Limit of 05th September 2018 to15th September 2018. Find out the important Details about the Telangana Ayush Job Vacancies Here or can also get the Credentials from the official Page. We are here to suggest the Valuable Details which will be helpful for the candidates to get Placed in the Telangana Ayush Medical Officer Jobs. Applicants are invited for the candidates through Online www.ayushrect2018.telangana.gov.in which is provided for the Candidates about the TS Ayush Recruitment 2018. For these the eligible candidates for appointment to the posts of Medical Officers (Ayurveda) -62, Medical Officers (Homoeo) -36, Lecturers (Homoeo)-11 and Lecturers (Unani)-8 on regular basis under the control of Director, Department of AYUSH, Hyderabad, Telangana state. So after completely Reading out the Officials Telangana Ayush Notification @ ayushrect2018.telangana.gov.in Regarding all the Details, Take the correct Decision if they are eligible for this Telangana Ayush Recruitment 2018 Process. Without having the Eligibility if Candidates have applied for this Recruitment, the authorities will not be permitted to give the Telangana Ayush Job Vacancies. The Telangana Ayush Selection Process will be completedly Based on the Merit List Basis. Those applicants who have the Perfect and the Highest Score in their Scaedfmic, they will be directly Getting the Appointment Letter from the Department Of Ayush, Ministry Of Health Medical & Family Welfare Board, that the Candidates to be selected for this Telangana Ayush 117 Medical Officer, Lecturer Job Vacancies. All the Information we have provided here that is very Relevant and we have given the Exact Information Only which is about the Telangana Ayush Posts. For all the candidates have to take a look on to this TSPSC Medical Officer Recruitment Proces sin order to make their Career Batter in the Ayurvedic Field. For Lecturer Homoeo-Must possess a Post Graduate Degree in Homoeopathy, awarded by any University in India established or incorporated by or under Central Act or an Institution recognized by the University Grants Commission or any Statutory. For Lecturer Unani-Must possess a Post Graduate Degree in Unani, awarded by any University in India established or incorporated by or under Central Act or an Institution recognized by the University Grants Commission or any Statutory Board of State Government in the concerned specialty allied as per CCIM latest regulation as notified above. For Medical Officer of Homoeo-Must possess a BHMS degree for the posts of Medical Officer (Homoeo) respectively awarded by a University in India established or incorporated by or under a Central Act or State Act or an Institution recognized by the University Grants Commission or any Statutory Board of the State Government. 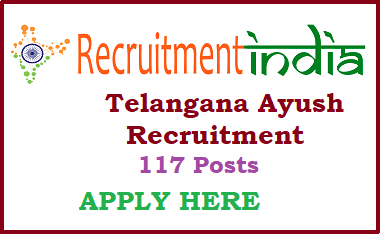 Candidates based on the Merit List Basis, and the score that they got in their academics basis, the candidate will be selected for this Telangana Ayush Job Vacancies. Medical Officer (Ayurveda) 62 Posts various Dispensaries located under the control of Director, Department of AYUSH, Hyderabad, Telangana state. Medical Officer (Homoeo) 36 Posts various Dispensaries located under the control of Director, Department of AYUSH, Hyderabad, Telangana state. For all the Candidates after the Registration Process, they have to Pay the online Application Fee of Rs.600/- per each Application. Candidates application fee is once paid, it will not be Refundable. For Lecturers Posts Pay scale: Rs.35,120/- to Rs.87,130/- And Other Allowances Allowable. For Medical Officers Posts Pay scale: Rs.37,100/- to Rs.91,450/- And Other Allowances Allowable. All the Registration links in order to enroll their Names in the TS Ayush Application Form we have given here. The candidate who will eligible they have to fill up the Online Application Forms in a correct manner without any Single Mistake, those applicants will only be having the Chane to shortlist their Names in order to Provide the Medical Officer (Ayurveda & Homoeo), Lecturer (Ayurveda & Unani) Jobs based on the candidates Educational Qualification and are suitable for the Telangana Ayush Recruitment Process. Candidates who will be selected to get the TSPSC Ayush Job Opportunity they will get the party scale For Lecturers Posts Pay scale: Rs.35,120/- to Rs.87,130/- And Other Allowances Allowable and For Medical Officers Posts Pay scale: Rs.37,100/- to Rs.91,450/- And Other Allowances Allowable. Interested and the willing Candidates have to connect this @recruitmentIndia.in Page to get all the useful Links or candidates can also find in the @ ayushrect2018.telangana.gov.in official Notification about the Telangana Lecturer Application Form. If they find the Links, they have to follow the Five steps. In that, first, they have to enroll their Nems and the upload all the Necessary Document in the Telangana Ayush Application Forms and then check out the application Status. After that Pay the application Fee after submission of the Online Telangana Medical Officer Application Form. If once the application fee is paid will not be refundable again. At last, take the print out of the Telangana Ayush Application Form and will be used for further who have applied for this Telangana Ayush Recruitment 2018 Process.